The Court Appointed Special Advocate (CASA) serves by judicial orders as on Officer of the Peoria or Tazewell County Juvenile Court. The volunteer CASA will become an independent advocate and fact finder while acting in the child's best interest. CASA's become involved in as many aspects of the child's life as possible. This is done through one-on-one visits, classroom visits, case worker contact as well as communicating with teachers and family members. At the time of each court proceeding the CASA will be required to submit a report to the judge with the observations that have been made over the six month period. 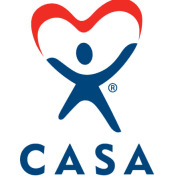 CASA's are asked to dedicate at least 5 hours a month to the case and commit to serving at least 2 years. CASA provides on-going education opportunities and asks the advocate commit to an additional 10 hours annually continued education.